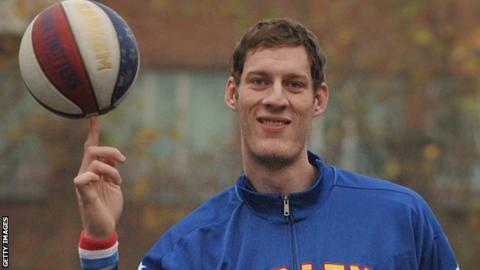 The world's tallest basketball player has signed for British Basketball League side Cheshire Phoenix. Paul Sturgess, who is 7ft 7in and wears size 20 boots, is the second tallest living Englishman. He spent two years with exhibition team Harlem Globetrotters and has been at Springfield Armour and Texas Legends. "I have been enjoying my time back in England and the chance to play in the BBL whilst I am here is something I will relish," said the 26-year-old. "I am excited to join my new team-mates and hope to fulfil whatever role is given to me." The tallest living Englishman is Neil Fingleton at just over 7ft 7in. Phoenix, who play at the Northgate Arena in Chester, are fourth in the BBL Championship table, four points behind leaders Newcastle Eagles.